The NGO Shipbreaking Platform, a global coalition of environmental, human rights and labour rights organisations dedicated to safe, clean and just ship recycling, organised a debate on “Environmental (in)justice and the role of European companies” on 9 July in Brussels. 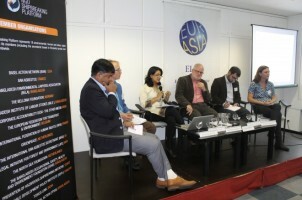 The event was hosted by the European Asian Institute Studies and co-organised with the European Environmental Bureau/EJOLT and the European Coalition for Corporate Justice (ECCJ). Jim Puckett, Executive Director of the US-based Basel Action Network, chaired the event, which was attended by EU and UN policy makers, representatives of the diplomatic corps of Pakistan, Bangladesh and EU Member States, NGO campaigners, business associations and experts from the ship recycling industry. The event started with Nick Meynen, from the Global Policies and Sustainability Unit at EEB, who presented EJOLT’s environmental injustice map, which was launched earlier this year. Nick Meynen called on everyone interested in exposing environmental injustice cases to contact EJOLT and to add further information to the map. Rizwana Hasan, Chief Executive from the Bangladesh Environmental Lawyers Association (BELA) and board member of the Platform, explained that companies based outside her country, including European ship owners and banks, that choose to send their toxic end-of-life vessels to the beaches of South Asia in order to maximise their profits, share a major part of the responsibility of the shipbreaking crisis. She emphasised that European governments claim that they do not have the capacity to deal with the recycling of their old ships, but expect developing countries to do it for them. Ritwick Dutta, lawyer at New Delhi-based Legal Initiative for Forest and Environment (LIFE) and board member of the Platform, summarised several prominent cases of large mining projects in India that met strong resistance from the local population and were eventually abandoned. Jérôme Chaplier, coordinator of the ECCJ, gave insight about current discussions at the EU level on how to hold companies accountable, for example by demanding they disclose information about their investments and their social and environmental implications. However, European policies to ensure transnational companies are held accountable, are still in their infancy. Further regulation is needed to address human rights violations, exploitation and environmental degradation caused or accepted when companies invest or produce goods abroad. Ingvild Jenssen, policy advisor at the Platform, summarised the latest developments on the EU level regarding the EU Ship Recycling Regulation and stressed that the regulation will only be able to live up to its promise to hold European ship owners accountable for their unsustainable shipbreaking practices if the EU decides to introduce an economic incentive that would help ensure cleaner and safer ship recycling by making re-flagging to flags of convenience less attractive for ship owners. The event took place while the NGO Shipbreaking Platform’s 19 member organisations (including the secretariat based in Brussels) were convening in Brussels for their annual general meeting, during which they discussed their campaigns in South Asia and in the EU.